King of the Greens has been the go-to landscaping company of North Carolina property owners when it comes to landscape development and installation. We have already designed and installed awesome landscapes for countless property owners in New Bern and surrounding areas. If you also want to have a professionally built landscape, please call us at 252-671-2817 today. Modesty aside, we’re certain that we have mastered all aspects of landscaping – from site preparation and design to installation and maintenance. We can also work on all types of landscapes – municipal, residential, communities, commercial, and industrial. Our expertise in all these areas is the result of thousands of hours that we dedicated to improving our craft. We attend industry training, do research, and apply whatever new ideas and techniques we have learned in our actual projects. So it doesn’t matter if you’re looking for a company to handle your lawn care needs or your outdoor living requirements since we can handle these tasks with great proficiency. 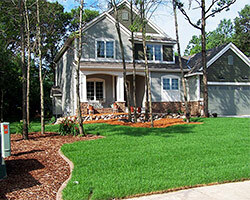 With us, you’re assured of expert people with the kind of versatility that only the best landscaping crews possess. We’ve heard countless horror stories from past clients who swore they would never hire a particular contractor again. Among their most common complaints is the lack of direction in how their past contractor had performed the job it was hired for. Such lack of clear path expectedly led to costly delays and dismal results that show the work of a neophyte landscaper. At King of the Greens, we’re proud to say that we follow a truly systematic process in handling all our landscaping tasks. We always start each project by holding initial client consultation. We offer our clients with great ideas on how we can ensure the success of the project and then provide them with an honest estimate of the project’s cost. Afterwards, we create the project plan outlining the schedule, design specifications, and everything else needed to get us into the right direction. Once the plan gets their nod, we will begin the project outright. We will arrive on time, dress professionally, and maintain a safe and orderly work environment without causing untoward disruption to our clients’ daily activities. And to make things even better, we will also perform a quality assurance check through our Quality Assurance Program. This feature lets us and our clients perform a thorough check of the completed work to see if we did our job as expected. So if you’re not satisfied in any aspect of our work, we’ll offer remedial work absolutely free of charge until you get completely happy with the outcome. We have a solid core workforce that includes versatile designers, heavy equipment operators, masons, builders, and artisans. In fact, we probably have the most talented and experienced landscaping crews among all companies operating in New Bern, NC. With us, clients like you are assured of exceptional results, whether you’ve tapped our service to create your dream outdoor amenities or you’ve hired us to work on the various stages of landscape development and installation. We offer our landscaping services at very competitive rates that property owners from New Bern and surrounding areas can easily afford. We have packages that can match different budget capabilities, and our payment options are designed to ensure that clients won’t have to stretch their budget. 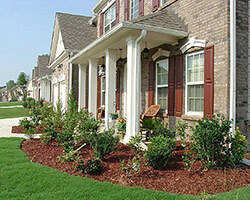 So call us now at 252-671-2817, and let us address all your landscaping-related concerns.